These are little 4"x6" sketches of barns that I've done to prepare for a commissioned barn painting and also to get back into creating compositions. The size is very forgiving and prevents me from investing too much time into a composition that's not quite working. Seeing them on the computer screen helps me to edit and see what needs to be tweaked. This is another 'visitation' of the theme of the Advent Star. This theme fascinates me (obviously) According to a meditation I read, this is the first invitation to the wider world to enter into God's salvation plan. To see the rest of the Advent Starry Night series, you can type 'Advent Starry Night " into the search bar at the upper left corner of the home page. And, yes, they are all most definitely also an homage to Vincent vanGogh! 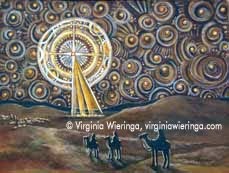 Having my painting ADVENT STARRY NIGHT 4 on the cover of Living with Christ (a meditation booklet from the Catholic Church) is creating a surge of visits to my blog! If that's what brought you here, welcome. 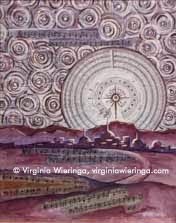 You may also want to check out my website, especially the section of Advent imagery , spiritual imagery, and icons. My first sale of 2012 and I'm going to ship it to Danbury, CT! This came as a result of another Starry Night being on the cover of Living with Christ published by the Catholic Church.